A new government investigation of Solarcity on the eve of its initial public offering (IPO) may explain how solar leasing is fleecing federal taxpayers and making U.S. residential solar more expensive than in other countries. Solar leasing lowers the barrier to entry for many people, allowing them to get solar on their rooftop without enormous upfront costs or the necessity of navigating local, state and federal incentives. In fact, the vast majority of residential solar being installed in the nation’s largest market (California) is leased, not owned. It’s not unexpected when installing and financing solar is so much more complex here, with 50 different state markets and complicated tax-based incentives. But this leasing middleman is the issue for Treasury because he’s allegedly inflating the cost of leased solar arrays to pocket unfairly large tax incentives. Solar leasing companies are reporting “fair market value” installed costs that are far higher than the actual cost of installing solar. This nets them a larger 30% tax credit (which is based on that reported cost), that largely goes to the bottom line rather than to the leasing customer. ILSR first covered this issue in May 2011, when I wrote about this phenomenon, tipped off by Jigar Shah from Carbon War Room that solar leasing companies inflated project cost estimates in order for their bank financiers to collect out-sized tax credits. But Jim Jenal added powerful evidence, culled from analysis of data from the California Solar Initiative. The practice of higher-priced leased systems is not new. 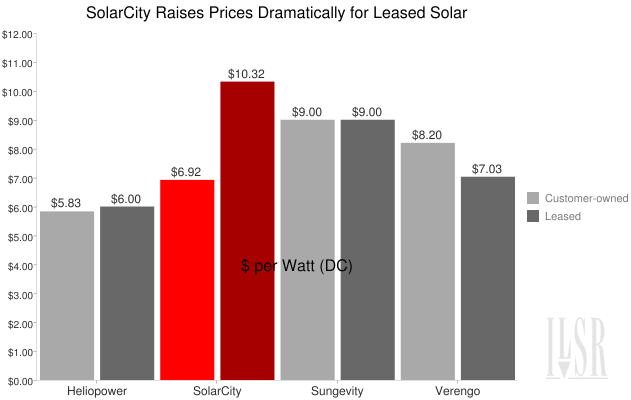 Mr Jenal finds that SolarCity has had a significant price premium on its leased systems since 2008. His chart is reproduced below. There are explanations, of course. Solarcity is one of the few vertically integrated solar leasing firms, handling everything from installation to financing. But the premium seems extraordinarily large even with the additional services. The Treasury Department seems to agree. Since the federal solar tax credit pays 30% of the system cost, and the significant markup on SolarCity’s leased system means a much larger tax credit. Mr Jenal calculates that SolarCity has cost federal taxpayers over $10 million in inflated tax credits since the beginning of 2008. SolarCity and its financiers (which include PG&E and U.S. Bank) presumably also took the federal depreciation bonus (also based on the system installed cost). At a 20% tax rate, the depreciation bonus would have a value of about two-thirds of the tax credit, adding another $6 to 7 million to the tally. The taxpayer cost may represent malfeasance, but in some ways it’s a side effect of a more pressing problem of leasing. In places like California, solar power already costs less than utility electricity (with incentives), and the gap is growing. But leasing companies don’t have an incentive to pass along the growing savings. If the utility sells electricity for 15 cents a kilowatt-hour and Solarcity sells it for 13 cents, customers feel like they get a good deal. 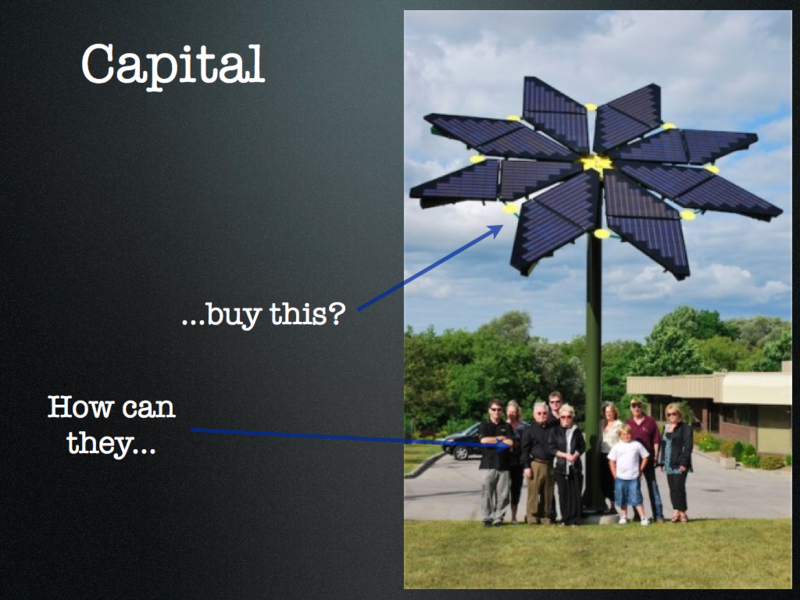 But what if Solarcity can generate that power for 9 cents (or less)? As more customers turn toward leasing, it may mean that U.S. solar prices will never fall to levels in the most advanced solar markets because middlemen will pocket the difference between low-cost solar and high utility rates. Even if Treasury finds Solarcity and other middlemen guilty of misusing the fair market value provision, it won’t solve the larger issue. Perhaps the solution isn’t just a consistent standard for middlemen to report the cost of solar. Perhaps it’s not having a middleman at all. producing the property (e.g. permitting, engineering, and interest during construction). The total business trail should not be charging more per watt then what is listed above. Again, these are the legal limits set by the IRS. Thanks John. Can you do a similar article on an oil company or something . . . they too are pummeling us in the solar. Actually, it seems to me like an opportunity for more leasing companies to go into business and compete. The Treasury doesn’t follow the guidelines in Tim G comments, they are 1 1/2 years old. After SolarCity and others taking advantage, Treasury now hoses closely related companies. As an installer in NY I know the solar kWh generation price is in the 4 cent per kWh range with the State incentive and Federal Tax incentives. Considering the purchasing power of the leasing companies, I reckon they must be able to get down to 2 cents per kWh, so they are making a killing. As others mentioned, they are doing a good thing by helping solar grow. However, one key thing with incentives from a state like NY, the stated goal of the program, unlike the Federal tax incentives, is to reduce the cost of solar to the point where it competes on its own with utility power. The leasing companies never want to see that because once that happens, no one needs them. One good and fair solution is that they not be eligible for the state incentives.